A design for the new building is drawn over an outline survey. 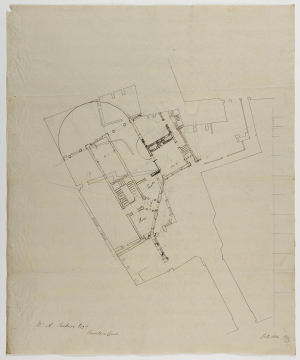 The design is by Soane's hand and is rough - for example, the curved rear wall has been drawn without the aid of a compass. The design itself is similar to a previous design  in that the warehouses make a horseshoe around a central court and staircase. However, in comparison to the earlier design the layout of the entrance and the porter's room has changed so that the two are mirrored on either side of a small vestibule and the horseshoe has been straightened and the overall width decreased. 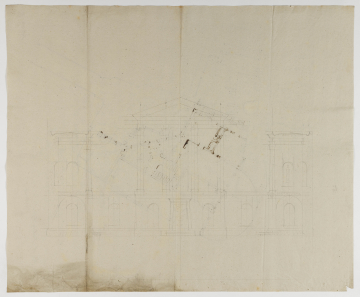 On the verso of the sheet is a design for the elevation to Fountain Court. The elevation has seven bays, the central three bays having a pediment supported by four columns (the order is unknown) and the outer bays having very shallow pediments or gabled ends. An interesting feature is the central entrance which tapers towards the top.